Making lunches is easier when you big-batch cook. Keep healthy, convenient, foods like cooked ground beef in the freezer and you’ll always have lots of quick and healthy lunch options. Kids Cook! Get your kids involved in the kitchen by having them help out with this recipe. Here’s what they can do! * Measure out ingredients (minus the spices! ), and chop vegetables with a kid-friendly knife. This would be a good time to discuss which parts of bell peppers are useful and which are for the compost bin. Cook ground beef and spices in Dutch oven over medium-high heat for 9 to 10 minutes, breaking into small chunks with back of spoon, until browned and completely cooked. Drain well, and return to pot. Add bell peppers and onions, simmer for 8 to 10 minutes until vegetables are softened. Add corn and heat through 1-2 minutes. Spread mixture in a single layer on several foil or parchment paper-lined baking trays; freeze just until meat is firm, about 1 hour. 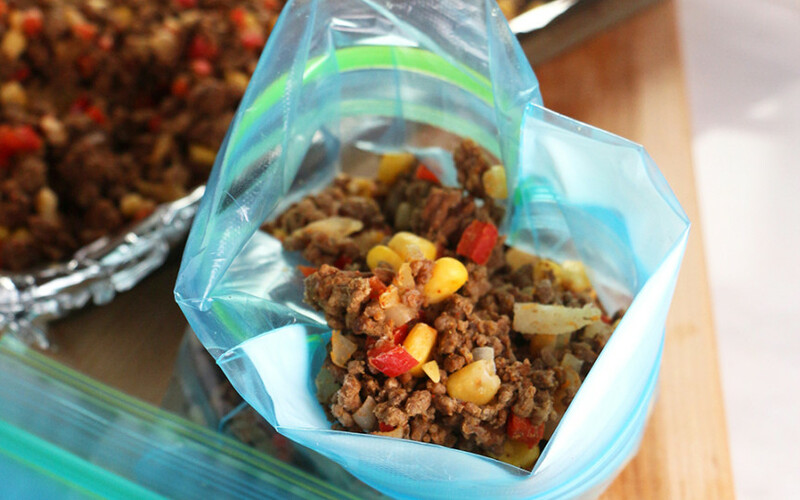 Loosen beef mixture into chunks; scoop meal-sized portions into freezer bags. Freeze for up to 3 months. Make Tex-Mex Tacos with Big Batch Tex-Mex Beef!